My newest addiction for backgrounds is from that book we got and I did the Versamark ink resist backgrounds on glossy photo paper. I have never tried this before and when I got our ATC background book and read the directions I immediately was intrigued. Didn't take me long to get addicted to this one, thanks to Gwenny for the background. Here I have done a cute little girl that has a Post Carde stamp on the background inked with distress dye ink in Cracked China and Frayed Burlap. Amazing how these ink colours work together. 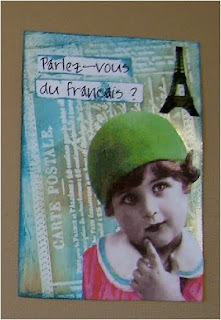 This cute little girl is looking for someone to speak French to. Don't ask me girlie, I know very little. And of course can't go without doing at least an Asian theme or two. 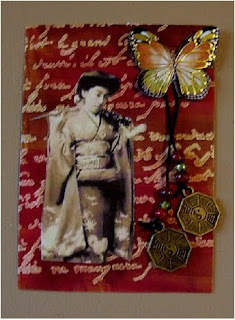 Here I used Fire Brick and Antique photo distress ink. Gives it a nice exotic background feel. I strung some beads I received in a swap recently with a few little asian coins as well. The title of this card is " My 2 yens worth". And this card I used Frayed Burlap distress ink and not as much Fired Brick. This woman doesn't have a clue what happened to the crow...a little mishap I would say?? She says....." See NO Evil"
ive been dying to try this too since i recieved gwenny's , it looks fantastic. I agree with Jen, have been wanting to try this and now it is a must after seeing your cards Les. That fire brick is so vibrant. 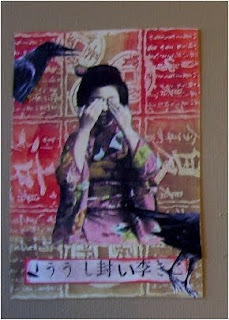 Showing your humor again...luv it, "see no evil." That little girl is darling, looks like she could jump right off the card. Nice to back with paper huh? Please share in my creative journey as I explore, play and gather insight into the processes of art. I welcome all comments, positive and critical ,but, please be kind. Thank you for dropping by, the blog door is always open. Please remember that this is my original artwork and I would appreciate it if you did not claim it as your own. We all like to share art and what and how we do it, if you would like others to see my tutorials or artwork I would appreciate you linking back to my blog and giving credit where credit is due. Craft fair season is over, time to stock up for next year! Tumble fish studios is BACK!!!!!!! Hello, Welcome and whats NEW! Making and hanging a flower panel. Flower wall. Whatever. Door Plate Wall Plaque or Scarf Hanger ?!?! Friday Challenge - Back to School! On Wings She Flies Challenge - Lost Coast Designs! My mother, Nancy Ward, passed away February 19th after a short illness. We miss her so much. Rare Bird Ltd – Gone,But Not Gone! 16 Horse Clip Art Images! Inkjet transfers and what does Stodgy mean?